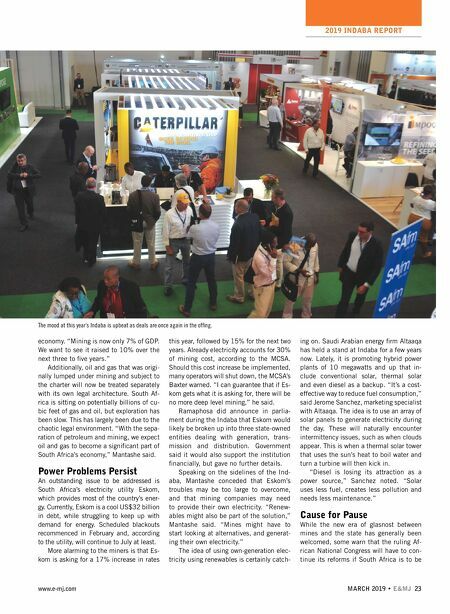 2019 INDABA REPORT 22 E&MJ • MARCH 2019 www.e-mj.com CAPE TOWN, South Africa—Africa's larg- est industry showcase, the Mining Inda- ba, has looked increasingly gloomy over the years. Now, for the first time in a half- decade, mining bosses and government officials are talking again. The mood in Cape Town was ebullient as bankers, ge- ologists and state officials mingled like old friends. "We are in a much better position to mine than we were a year ago," said Rog- er Baxter, CEO of the Minerals Council of South Africa (MCSA). "The Department of Mineral Resources is talking to us. The minister and his officials are talking to us." Until recently, the relationship be- tween state and industry was so poor that months would pass without commu- nication between either. Under former President Jacob Zuma, and his Minister of Mining Mosebenzi Zwane, relations soured to outright hostility. "Last year, we had a minister with malevolent in- tent," Baxter said. "Now it's completely changed. The new administration is open to talking to us, and working with us." That difficult period took its toll on the South African mining sector. Over the past five years, mining shed 56,000 jobs, sinking the total employed in the sector to around 450,000 people. Meanwhile, almost no growth in fixed investment was recorded in 2018. What has changed, however, is that Zuma was ousted in February 2018 and replaced by Cyril Ramaphosa, himself a for- mer trade unionist and later, mining inves- tor. He in turn appointed Gwede Mantashe, a one-time trade unionist and ex-mine work- er who toiled underground for 13 years. Charm School Together, they launched a charm offensive at Indaba. Ramaphosa was the first South African sitting head of state to address the Indaba in its 25-year history. It was standing room only in the main hall of the Cape Town International Convention Cen- ter when he spoke. Ramaphosa acknowl- edged the difficult period that proceeded his taking office. However, his administra- tion had already met the investment tar- gets that he had announced shortly after taking office, an indication that his gov- ernment was getting the message through that it was open for business. "We wanted to raise US$100 billion in five years," he said, referencing the target he announced last year. "In a few months, seven months at that, we were able to mo- bilize full commitments that are backed up by projects of US$20 billion," he said to applause from the audience of 1,000 bankers and mining executives. By far the most significant step of the Ramaphosa administration was to withdraw the draft revised Mining Charter, which in- tensified pressure on companies to spend more on social development, adding more layers of non-mining costs. Significantly, the mining industry had almost no say in the charter's design. By mid-2018 with Zuma and Zwane gone, the charter had been withdrawn and a new version drafted in partnership with the industry. Mantashe for his part used his keynote address to reassure delegates that under a new regime, the policy environment has changed for the better. "We are emerging from testing years behind us," he said. Now, government wanted to see mining re-establish its importance to the local Investment Mood is Much More Upbeat a Year After Regime Change A large crowd gathered at the Cape Town International Convention Center to hear the new South African President Ramaphosa address the mining business By Gavin du Venage, South African Editor New Mining Minister Gwede Mantashe waits to take the stage at Indaba. 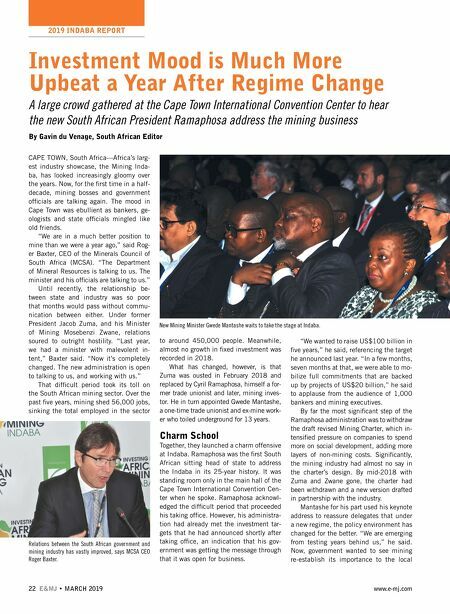 Relations between the South African government and mining industry has vastly improved, says MCSA CEO Roger Baxter.